Crafted from our signature vintage wool, classic jumper is an easy-to-wear winter layer. The contrast colour detailing around the neck and cuffs adds verve. Top with our luxury Vintage Wool Bomber Jacket for effortless style. Our vintage wool – otherwise known as Q (for Quality) 12 – is spun specifically for us by an Italian mill steeped in years of heritage and expertise. It is a luxurious two-fold merino that was developed from an archive sample of Sunspel underwear. As it originates from a garment worn directly next to the skin, the fabric is supremely soft. While knitwear is typically made using the ‘fully fashioned’ construction process, we take a rather different approach with our vintage wool collection. Instead of knitting each pattern piece to shape, before knitting them all together at the seams, we use ‘cut and sew’. This is the same technique that is used to make cotton jersey garments and describes the process of cutting each pattern piece from a large square of knitted fabric, before sewing them all together at the seams. 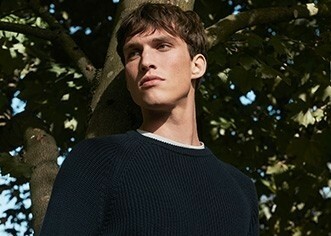 The result is knitwear that is just as comfortable as a well-worn T-Shirt. Waist 23" 25" 27" 29" 31"
Hip 33" 35" 37" 39" 41"